How to restore a failed septic system. The White Knight System septic remediation technology consists of mechanical components: air pump, microbial inoculator/generator, effluent filter and pump failure alarm, and a patented microbial inoculant (IOS-500 from International Organic Solutions, Inc.). 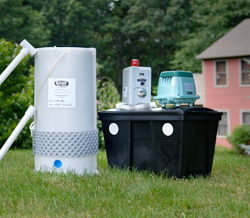 The Microbial Inoculator Generator turns an anaerobic (without oxygen) septic system into an aerobic (with oxygen) environment. The combination of oxygen with a select group of microoganisms is proven to recover organically clogged leachfields. Air Pump Basin, weatherproof construction, used for outdoor air pump enclosure when required. 1/2" ID, Sch40, PVC air supply line. White Knight (Patent Pending) Microbial Inoculator/Generator installed in septic tank. Install in 2nd compartment of 2-compartment septic tank. Effluent Outlet Filter to retain non-biodegradable materials. Pump Failure Alarm located in Dwelling. Our patented microbial bacteria, developed for use in petroleum industry remediation decades ago (eg: Exxon Valdez Alaskan oil spill), introduced into the Microbial Inoculator/Generator quickly grow and consume organic waste, including intestinal bacteria within the septic tank. Effluent leaves the septic tank along with IOS-500 specialized microbes and continue to consume deposited organic compounds or Biomat, restoring soil particle pore space and natural drainage pathways. Within weeks, your failing septic system is returned to its original wastewater treatment capacity.